Friends and Heroes - now available to stream worldwide. The award-winning Bible story adventure series, first broadcast by the BBC, is now available to view online through Vimeo on Demand - the video streaming platform trusted by professionals worldwide. With 39 episodes available to rent or buy in 12 languages, this new service brings the popular TV/DVD series to a huge audience across the globe. Friends and Heroes is a series of animated adventures set in the first century, bringing the timeless stories of the Bible to life for a new generation. Using a combination of traditional animation and stunning CGI, our stories follow the adventures of two young friends, Macky and Portia, as they fight for justice against the Roman Empire and share the stories of their heroes from the Old and New Testaments. Ideal for all children aged 5-11, the action and adventure in each episode is particularly loved by boys. Friends and Heroes on Demand can now be streamed and viewed on TV, smartphone, computer or tablet, whenever a viewer wants and wherever an Internet connection can be found. Go to www.friendsandheroes.com/vod to find out more and view samples. Warrington girl wins Bible story competition! Anna Naomi Marshall, aged 9, from Warrington has been declared winner in an exciting interactive competition run by Plus Eagle Wings (PEW) and Friends and Heroes. To win the competition Anna had to view the Old Testament story of Ruth taken from Friends and Heroes, Episode 7 and then correctly answer a series of questions about the story. Her entry was chosen from a multitude of entries received. Anna’s prize, a limited-edition Friends and Heroes DVD player with a DVD, will allow her to watch her favourite DVDs at home, on holiday and even in the car. "It helps you learn about God and it's fun!" Nine year old Kerryn Lewis won the Friends and Heroes New Year online competition, answering all questions correctly. Kerryn's winning slogan was "I like Friends and Heroes because it helps you learn stuff about God and it's fun!" Kerryn (right, pictured with her sister, Hannah) received her prize of a portable DVD player plus DVDs from Friends and Heroes Dave Carlos. The popular homeschool magazine Practical Homeschooling recently gave Friends and Heroes Homeschool Curriculum a glowing review and strong recommendation. Practical Homeschooling described Friends and Heroes as "quality animated stories" and said that "the unit studies definitely take the DVDs to a whole different level." The review concluded by stating that Friends and Heroes Homeschool Unit Studies are "Highly Recommended!" CM Buzz recommends Why does Easter matter? 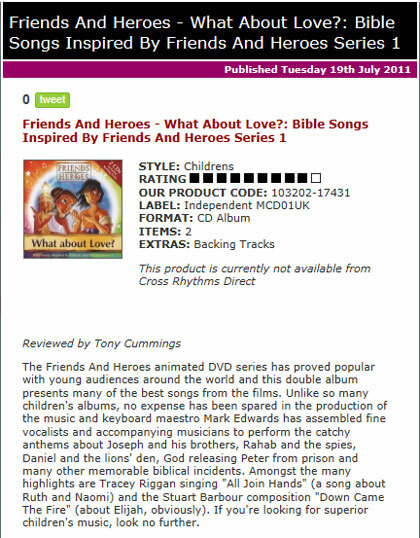 The children's ministry website CM Buzz recently reviewed Friends and Heroes new Easter resource Why does Easter matter? Reviewer and children's ministry leader Keith Tusing described the animation as "dynamic" "along with music that will stir hearts and move your soul." He also went on to say that he appreciates the fact that this ministry resource can help families discover and understand the true importance of Easter. The review concluded by saying, "I would highly recommend this series to Kidmin Leaders and Parents who desire to help their children focus on the true meaning of Easter." 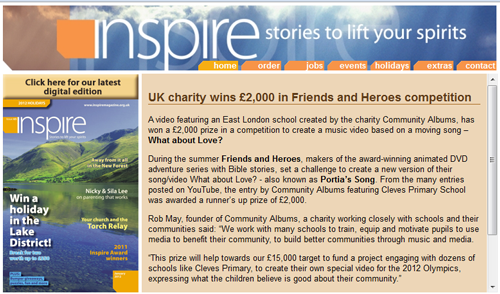 Inspire Magazine's online version featured Community Albums, the joint second prize winner in our Portia's Song Competition. This charity works with many schools particularly in East London, Oxfordshire and Northamptonshire to train, equip and motivate pupils to use media to benefit their community and to build better communities through music and media. You can read about all the winners here and read the Judges comments here, or view the £10,000 prize-winning video and all the other entries by clicking this link. Cross Rhythms awards What about Love? 9 out of 10! "If you are looking for superior children's music, look no further." Kingdom Vision is a web magazine published by Soul Mission, a charitable Company based in Truro, Cornwall. It was created for the church – in all its varying sizes, shapes and denominations – and they have reviewed and featured Friends and Heroes on their pages recently.